Natural hormone found in the body that can help combat physical and emotional stress and may reduce stress-related fatigue. 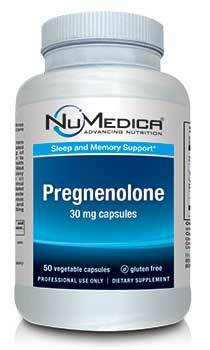 NuMedica Pregnenolone is a hormone produced in the body like DHEA and is associated with stress resistance and hormone balance. Because this natural hormone has virtually no side effects, it is ideal for people who want to combat emotional stress and fatigue with a supplement that is safe, natural, and effective. If you have been under serious emotional stress, your hormone levels could use a boost so that you can cope with this emotional and physiologic stress better. Stress can take its toll on both your physical and emotional health. Our bodies our designed to cope with stress, but even so, stress wears down our defenses over time. Stress can impede immune system function, cause mental disorders, and even impact our cardiovascular health. Many people experience sleep disorders like insomnia while others may suffer from intense fatigue. NuMedica Pregnenolone is designed to boost your body's natural support system like adrenal hormones that are a first-line of defense when it comes to coping with stress. The hormone pregnenolone works naturally with your body to combat the negative effects of stress. When taking NuMedica Pregnenolone, you may experience benefits like improved mood and energy, stronger immune system function, reduced fatigue, and even reduced symptoms of PMS. If you want to feel energized naturally, this supplement is a powerful support that is not associated with any harmful effects. 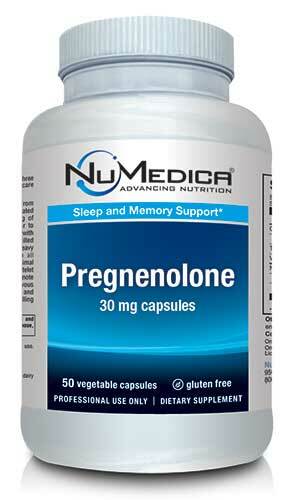 Studies have also shown that pregnenolone is helpful for enhancing memory and cognitive function. If you feel yourself having a difficult time keeping up with your workload, for example, this supplement may provide you with the boost you need both physically and mentally to more easily manage your daily life.